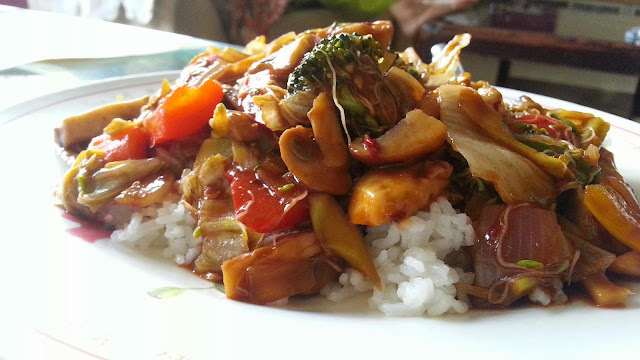 Stir Fried Veges with Steamed Jasmine Rice My Style. In the pan, heat oil and add finely chopped garlic. Once the garlic is golden brown in color, add the broccoli, mushrooms, red, yellow and green bell peppers, onion dices and toss. Sprinkle some flour and make sure that the vegetables are coated with the flour. Add in more water if needed and bring to a boil. Once the vegetables are cooked and the water has reduced, turn of the flame and add in the alfa alfa sprouts, bok choy and the ice berg lettuce. Lastly season with salt and pepper and serve along with jasmine rice.